Catalog essay from Love, Life and Death at California Institute of Integral Studies, San Francisco, California. Oil on canvas, 51 x 38 in. The thorns form a perimeter of defense in one sense. They naturally grow from the base of the black locust tree parallel to the ground, preventing intruders from scaling their trunks. In Bolingbroke’s arrangements they function as gates to the inner realm of the picture plane. The viewer is not prevented from entering, though. Objects encircle, sometimes swirl around, the center, creating a vortex that naturally draws us in. This is an active space much in the way that Albert Chong’s (born 1958) photographs of self-ritualizing spaces — the thrones and seats supporting or surrounded by like things; skulls, eggs, flowers, horns, branches — transport the viewer, “cross[ing] the void” that is “self-absorption,” and, as Jung has stated of the self, the non-ego, into the “premonition of a centre of personality, a kind of central point within the psyche, to which everything is related, by which everything is arranged, and which is itself a source of energy.” It is a charged space in much the same way that Gin Louie’s (1946-1994) assemblages treat objects as quantum in an overall field of energy. 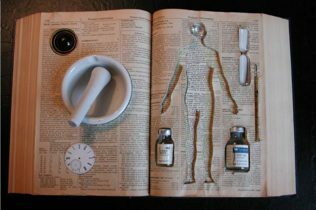 In Untitled #3 (1993; Private Collection, New York), depressions carved from the pages of an open Physician’s Desk Reference serve as niches for an array of objects the artist employed to combat illness, the tools prescribed by Western medicine countered or balanced by personal talismans. 12 x 24 x 4.2 in. Mortality is a central motif in Bolingbroke’s compositions. For one, the appearance of the skull transports the viewer beyond the threshold of consciousness of the day-to-day. 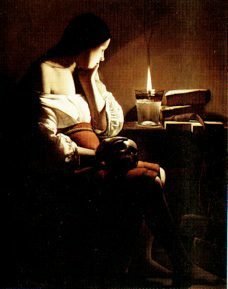 In the French painter Georges de La Tour’s (1593-1652) depiction of Magdalene with the Smoking Flame (c. 1636-1638; Los Angeles County Museum of Art, Los Angeles), and several other versions of a Mary Magdalene who has forsaken the worldly for the spiritual, the skull serves as a fulcrum upon which the figure meditates. In the Los Angeles painting, the Magdalene’s left hand touches a skull resting in her lap, half in shadow, beyond which is the flame of a candle, while her right hand supports her chin. The pairing of skull and book is evident in several of the Spaniard Francisco de Zurbarán’s (1598-1664) paintings, including Saint Francis Meditating (1639; The National Gallery, London), where the saint’s right hand holds the skull while the left forearm rests upon a closed book, and The Temptation of Saint Jerome (1639; Chapel of Saint Jerome, Monastery of Guadalupe), where several books, placed before the figure, build up and cascade over a single skull whose cavernous eye sockets stare out at the viewer. These skull-and-book still lifes within larger compositions reconcile a past of self-absorption with a present desire to seek knowledge, the texts pointing to a spiritual self. The skull served as a vehicle for Buddhist meditation in India. In Tibet, skull and bones served in the making of many ritual objects. Libation vessels, lined with brass and encrusted with turquoise, were fashioned from the skulls of holy men. Bolingbroke’s use of the skull also invites meditation. The entire picture becomes the meditative vehicle with all pictorial elements actively engaging first the senses, then the mind. The viewer does not passively gaze upon the scene of a saint in meditation, but, rather, takes on the role of pilgrim to a holy ground. The text is not an open book but, instead, the very objects arranged within Bolingbroke’s compositions. The remains of not just human, but also dog, ferret, and deer, combine with other visual cues to bring the interior world of these works more closely to our contemporary moment. One may think immediately of the painter Georgia O’Keeffe (1887-1986), whose signature works present iconic images of flower and bone. 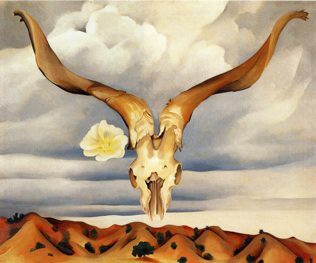 Ram’s Head with Hollyhock (1935; Collection of Edith and Milton Lowenthal) presents the objects of the painting’s title floating above a New Mexican landscape, dramatic clouds in the far background, with the lower tip of the skull nearly touching the top of a distant mountain range. While Bolingbroke sees no affinity between himself and O’Keeffe, there are like-minded sensibilities at work here. O’Keeffe observed that: “To me they are as beautiful as anything I know. To me they are strangely more living than the animals walking around…The bones seem to cut sharply to the center of something that is keenly alive on the desert even tho’ it is vast and empty and untouchable—and knows no kindness with all its beauty.” Bolingbroke himself speaks of the one human skull that he uses in his compositions as being quite alive, quite animate. If through the engagement of the senses the viewer is transported to the door of a spiritual plane, any understanding of the material world is altered as well. 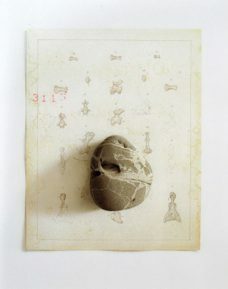 There is in the animation of objects in Bolingbroke’s watercolors something akin to the work of draughtsman and painter Alan Magee (born 1947), whose meticulously rendered objects, including smooth stones and bones, links attention to the world with the realization of its inherent beauty. For one who draws and paints, “beauty may be the energy source for the spirit, the place within the mind where sympathy, concordance, kindness are born and regenerated.” In this regard, Bolingbroke’s compositions serve as vehicles of compassionate reorientation to the known world. The medium of watercolor is known for a translucency that indicates its aqueous properties. Rather than exploit the potential of this medium for the variegated surfaces achieved through loose wash techniques, Bolingbroke layers with a dry brush, creating a solidity for the object. Where the viewer is reminded of water is in the compositional flow of elements, swirling, circling, eddying. Water has an iconographic presence besides. Bolingbroke speaks of the healing nature of water and the still pools of water that appear in glasses signify the importance of its symbolic presence. The text of the artist’s meditations is intimately linked to the medium of water. Flowers herald rebirth through the reproductive cycle. Stones appear smoothed down by erosion, water and mineral as active forces together. Flowers are most strongly associated with sentimentality in American culture. But here they serve as a focus for contemplation, facilitating our discovery of life’s constant renewal. Bolingbroke most often begins a work with a flower. In Love and Death #2, rose petals float around the image of a central skull. Their movement appears to travel outward. Life and Death are configured as emanating from the same source. It is not either/or when trying to grasp the relationship between the two. Butterflies signify that the same relationship is at work. This brief phase of the animal’s life is expressly designed for reproduction, and with the collaboration of the flower, pollination. the leaves encircle and dance. 2 William Bailey quoted in Mark Strand, editor, Art of the Real: Nine American Figurative Painters (New York: Clarkson N. Potter, Inc., 1983), p. 32. 3 C.G. Jung, “Concerning Mandala Symbolism,” from C.G. Jung, The Archetypes and the Collective Unconscious (Princeton, NJ: Princeton University Press, 1968), p. 388. 4 Albert Chong quoted in “Albert Chong: Across the Void,” Contact Sheet 105 (2000), p. 2. 6 Elizabeth Lyons, Ch’eng-mei Chang, Heather Peters, Gregory L. Possehi, Buddhism: History and Diversity of a Great Tradition (Philadelphia: University of Pennsylvania Museum, 1985), p. 38. 7 Georgia O’Keeffe quoted in Lisa Mintz Messinger, Georgia O’Keeffe (New York: Thames and Hudson and The Metropolitan Museum of Art, 1988), p. 72. 8 Alan Magee quoted in Alan Magee: Paintings, Sculpture, Graphics (New York, Los Angeles: Forum Gallery, 2003), p. 33. 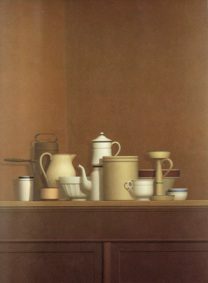 The still-life is a genre that asks the artist to look truly, clearly, selflessly. Nuances of form and color, light and shadow are transcribed with a regard that is usually reserved for objects of devotion. Embedded in each artist’s patient practice is an unspoken act of veneration. In the still life’s of Richard Bolingbroke, we see the art of watercolor performed with a lyrical precision. With the directness and subtlety inherent in the media, he represents convoluted flowers and bold patterns with equal ease. But for this artist, rather than just conjuring gratifying illusions, he creates imaginal worlds that pay tribute to the vivid and vulnerable reality that is our world. Bolingbroke’s two recent, ongoing series have distinctive, yet related approaches to this homage. 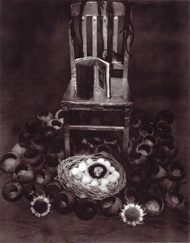 In the Studio Still Life Series, he has chosen prized objects: flowers, fruit, vases, shells, Japanese kimonos, and a glass of water, and from these he has lovingly created complex visual fields. The welter of fabrics and things, viewed from above, can be disorienting, even intoxicating, as the patterns’ images appear as real as the objects placed upon them. The watercolors of this series seem to honor the gloriously confounding attractions of the tangible and visual world, with its ever-slipping sense of what is real and what is illusory. Bolingbroke’s second series, Rituals and Meditations, focuses on a Japanese lacquer plate, with faceted sides. Centered on a square sheet of paper, with a plain or patterned background, the plate sits filled with flowers, surrounded by leaves, thorns, or stones. From this repertoire of geometric and organic objects, again seen from above, the artist creates a kind of mandala-like altar with offerings. Standing before the watercolor, the viewer may realize that this is a shrine to life itself, both abundant and fragile. Contemplating the image of dry, brown leaves and the over-sized thorns of a locust tree encircling the plate with four irises, we recognize that this is a vision of suffering and blooming freshness, seen in their reciprocal wholeness. Bolingbroke asks the viewer to look at rocks and flying cranes, red amaryllis and blue glass with equal reverence. An artist’s faith in seeing and making visible bears witness to the never-ending gift that is this world.